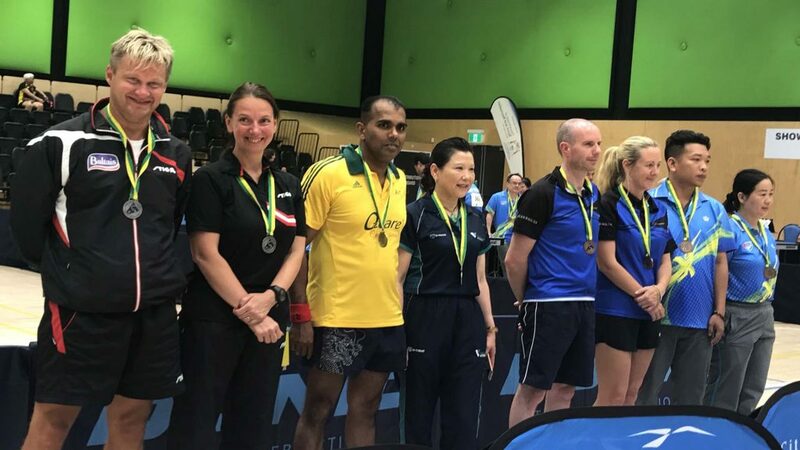 Located some 45 miles south of the state capital, Perth, the coastal resort attracted no less than 416 players; the highest number of competitors witnessed for any tournament on this year’s Table Tennis Australia calendar. Notably in addition players from throughout Australia taking part, competitors travelled from China, Japan, Latvia, New Zealand, the United States, Vietnam and Wales for the week-long event. Impressively, there were no less than 55 events held with the age range starting as young as 30 years, the most senior commencing for those some half a century older at 80 years. There were plenty of opportunities to depart Mandurah with silverware. Seven age group categories for both men and women were held (30-39 years, 40-49 years, 50-59 years, 60-64 years, 65-69 years, 70-74 years, 75-79 years, 80 years and over) with Men’s Singles, Women’s Singles, Men’s Doubles, Women’s Doubles and Mixed Doubles competitions being staged in all age groups. Additionally, there were Men’s Team events in each category; in fact it was more. In the 40-49 years and 50-59 years there were two such competitions. Meanwhile, in the Women’s Team itinerary, there were five events: 40-49 years, 50-59 years, 60-69 years, 70-74 years, 75 years and over. Furthermore, there were several notable names on duty; in particular four players who had competed in the Men’s World Cup were present. The host nation’s Paul Pinkewich won Men’s Singles 65-70 years, beating compatriot James Wong in the final (7-11, 11-5, 11-1, 11-9). Meanwhile, Paul Langley, also from Australia in addition to New Zealand’s Barry Griffiths and Khao Nguyen of the United States, were on duty in Men’s Singles 40-49 years. Somewhat surprisingly, no member of the trio secured the top prize; that distinction went to Latvia’s Sandijs Vasiljevs. After accounting for Barry Griffiths at the quarter-final stage (11-3, 12-10, 11-6), he overcame Paul Langley in the final (6-11, 11-5, 15-13, 11-7), the latter having beaten Khao Nguyen in the penultimate round (12-10, 11-8, 3-11, 11-5). Paul Pinkewich competed in the first four editions of the Men’s World Cup from 1980 in Hong Kong to 1983 in Barbados; Barry Griffiths was present in 1988 in Wuhan and the following year in Nairobi. More recently Paul Langley played in 1994 in Taipei City and in 1995 in the French city of Nîmes. It is anticipated that next year, the 35th Australian Open Veteran Championships will held in Bendigo.